Scrolling through my Instagram account a couple or so weeks back I came across an OoniHQ post about an autumnal pizza using spiced pumpkin puree instead of tomato sauce, which was topped with zucchini, pine nuts and fresh chilli. 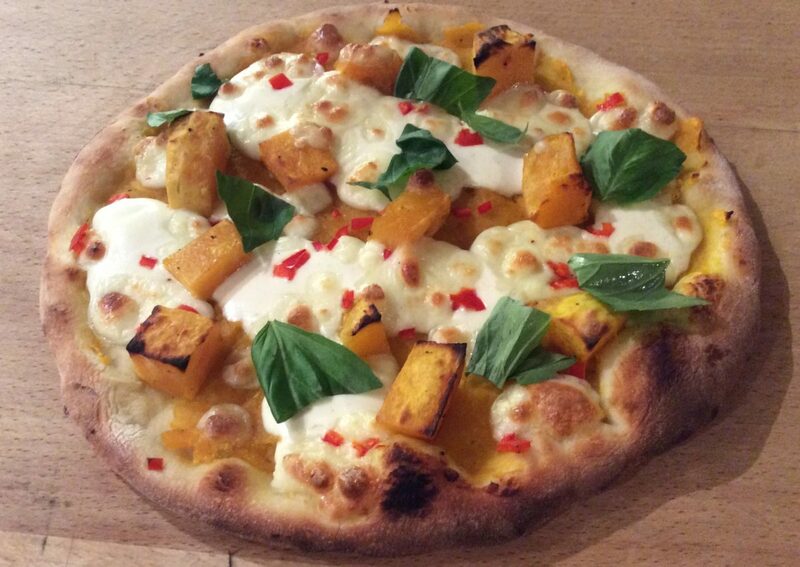 Scrolling down even further I came across another autumnal pizza topped with butternut squash, chilli, mascarpone, mozzarella and basil. Inspired and intrigued by these more unconventional toppings and with a couple of butternut squashes in my fridge from our neighbour who has a very productive vegetable garden, I decided that I would give both of the pizzas a go. Not put off by the autumnal weather and the dark (it only added to the theme), my husband, Jo, fired up our UuniPro. Okay, he didn’t fire up our UuniPro immediately as I had quite a few preparations to do (if you own an UuniPro, you will know that it doesn’t take very long to get to the required temperature) but he did when he knew that I was nearly ready for the pizzas to be cooked. When I say that I had a few preparations, I mean the making of the pizza dough and in this case, the making of the pumpkin puree. If I can say so myself (although they do say that pride comes before a fall), I have got my tried and tested pizza dough down to a fine art. In the early days, I used to knead the dough by hand but one day when I was pressed for time I decided to use my trusty Kenwood instead. Releasing 10 minutes of my time to do other preparations, the dough was kneaded just as well with my Kenwood dough hook than by hand. That being said, I always finish the dough off with a bit of hand kneading before proving, just to ensure that the dough is beautifully smooth and elastic. The pumpkin puree was made by simply roasting and pureeing the pumpkin and then adding olive oil, garlic and seasoning. Once the dough was proven, divided and shaped, the only thing left to do was to top both varieties of the pizza with the pumpkin puree, add the respective toppings and bake them in my UuniPro. I should possibly mention that Ooni’s recipe for one of the pizzas was for a vegan pizza i.e. pumpkin puree, courgette and chilli. I added a bit of mozzarella as I am a bit of a cheese fiend. I am sure that it was not necessary, but I personally loved the addition of a bit of melted mozarella. The result of my husband and my toil was two vibrant and delicious varieties of pizza. Warming to look at and warming to eat (aided of course by the hint of chilli on both) – perfect for an autumnal evening. Inspired by my autumnal pizza experimentation, I used the remaining two portions of pizza dough the following night to make another non-tomato based pizza. This time, I topped my pizza dough with a mound of mushrooms, sauteed in olive oil and garlic. To this, I added a generous sprinkle of freshly ground pepper, mascarpone and Parmesan before baking. With the final addition of fresh parsley before serving, Jo and I tucked into another delicious pizza. I have to say that this concoction was a treat for the taste buds and definitely one to be repeated. Having bought our UuniPro this year, I have definitely been stretching myself (and a lot of pizza dough) when it comes to pizza toppings. With the ideas on Ooni’s Instagram and Facebook pages, as well as their website, I don’t think I will ever be short of ideas.